About: At Cutler Rader, P.L. we handle cases at all levels of litigation, including personal injury, automobile accidents, slip & falls, medical malpractice, premises liability, wrongful death and many other injury related cases. 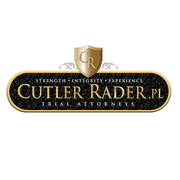 Andrew Rader and Ken Cutler, the firm attorneys, have extensive trial experience and have handled thousands of personal injury cases, resulting in millions of dollars in compensation for our clients. They would love an opportunity to help you as well. Our Firm is here to help you. Our Firm carries an “AV Pre-eminent Martindale-Hubbell Peer Review Rating”. It is the highest rating accomplishment and was established as an objective indicator of a lawyer’s high ethical standards and professional ability, generated from evaluations of lawyers by other lawyers and judges.